Isabel "Stan" Stanley is a 30-something author of children's books that has tried her best to avoid romantic entanglements all her adult life. They tend to complicate things too much. Add to that her strict Baptist upbringing and her mother who sees it as her duty to marry Stan off, and regards one of her necessary chores to play matchmaker for Stan and men who Stan has nothing in common with. On the way home from choir practice one evening, while driving through a hail of gunfire, a mysterious stranger comes through her sunroof who evidently has been shot. He passes out and she has to take him to her vet to get medical attention because the guilty gunmen seem to be waiting for their victim at the hospital. This new, mysterious stranger is very handsome and just does not fit the profile of a bad guy, even though Kelvin Kapone (with a K) has just dove through a plate glass window being shot at and is now bleeding all over the inside of her car. As each day goes by, she can't quite figure him out-- is he a good guy she should be interested in or a bad one to avoid?-- because, ever since that first extraordinary meeting diving into her car, every day someone has tried to kill her, and he must be somehow connected. A mysterious plot unravels, that seems to involve people in the community she knows that have connections she would have never guessed, and seems to involve espionage, terrorism, the CIA and ex-in-laws. 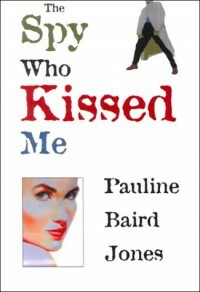 I laughed out loud many times in the book-- author Pauline Baird Jones' sense of humor and style of writing is very enjoyable. I would recommend this book to any who enjoy romantic comedies and romantic suspense as well as a fun mystery. I received this book from the author in exchange for an honest review-- thank you!